In 1980, Ron Gregg, a physicist and dedicated mountaineer, found himself on Alaska's Denali in a perilous situation. His climbing partner had suffered extreme frostbite due in part to poorly designed gaiters. Snow had been pushed between gaiter and boot, worsening an already nasty situation. After his friend was airlifted to safety and the expedition over, Ron reacted by searching for a solution to keep this situation from happening in the future. The result was a functional, insulated gaiter, the X-Gaiter™, which held snug and was versatile enough to fit a variety of boots. From this original inspiration and its resultant innovation, Outdoor Research was born the following year. 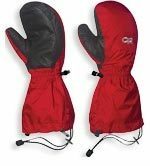 "The result was a functional, insulated gaiter, the X-Gaiter™..."
Ron's goals in those next formative years remained focused on creating practical, functional tools and solutions to the problems faced by outdoor enthusiasts in the backcountry. Early examples include the Water Bottle Parka®, which still remains the standard for keeping water from freezing in cold places and OR medical kits, which were the first soft-sided medical kits designed for outdoor adventure. Through the first decade, OR's growth was fueled to a great degree by developments in handwear, headwear, and gaiters. 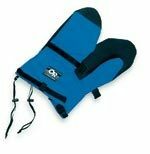 In 1984, OR Modular Mitts™ again revolutionized standards in the outdoor industry. With Velcro-attached Moonlite Pile liners, Gore-Tex shells, and "idiot cords" to keep them from blowing away, the mitts allowed for greater versatility and protection than any other mitts at the time by providing options for varying conditions.On multi-day trips a climber could dry the liner at night and start each day with a dry mitt. The Seattle Sombrero™ was introduced in the mid-80’s. Over the years it has become the best selling Gore-Tex hat of all time and one of our cornerstone products, setting the standard for rain hats. 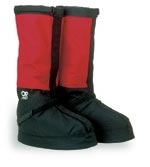 Brooks Ranger Overboots™ were introduced in 1988 to insulate the feet of the coldest of cold-weather adventurers. They have since traveled many times to the summits of the world’s highest peaks and to both poles and remain in our product line today. The 90's led to innovation in new areas. After a wet and uncomfortable couple of nights in a bivy sack during a backcountry trip, Ron designed a line of bivies that revolutionized lightweight shelter. Utilizing a patented 2-pole system, these new bivies allowed for multiple configurations including a star-gazing position. Backcountry insomniacs rejoiced! "The Seattle Sombrero™ was introduced in the mid-80's. 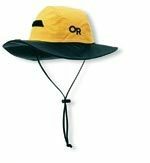 Over the years it has become the best selling Gore-Tex hat of all time and one of our cornerstone products, setting the standard for rain hats." Other ground breaking products included waterproof stuff sacks, a line of women’s technical apparel under the Wild Roses brand name, waterproof soft shell gloves, the first soft shell apparel designed in North America, and a line of WindStopper fleece hats. OR also moved the factory and offices to a new location in the SoDo neighborhood of Seattle and opened a retail store where customers could find the entire product line. During the early 90’s, the US government took notice of our expertise, and we have since been a supplier of high-quality handwear and headwear to the US military. The turn of the century witnessed expansion of our traditional categories as well as new ones; a men’s apparel line, a group of travel accessories, and a line of lightweight and innovative shelters. OR had now grown into a leader in the outdoor industry and a trusted brand for outdoor enthusiasts worldwide. With the addition of apparel, the company had taken a step beyond its well-known position as the top “accessory” brand to a place where our customers could be covered head-to-foot in Outdoor Research gear. It was an exciting time both inside and outside the walls of OR. On March 17, 2003 the unthinkable rocked OR. 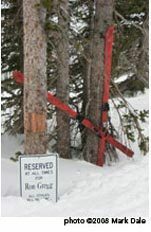 While skiing the backcountry of British Columbia, Canada, Ron and a friend were caught and killed in an avalanche. Family, friends, the team at OR, loyal customers, the outdoor industry, and the world of adventure lost a one-of-a-kind treasure that day and OR the company lost its steadfast leader; Dr. OR. The way forward was unsure – Ron was the central driving force of Outdoor Research. He had started the company in his basement and had remained deeply involved in all aspects of his company right up to the moment of his death. As always, Ron was testing new gear ideas on the day of the avalanche. "On March 17, 2003 the unthinkable rocked OR..."
After several months of assessment, Ron's heirs made the difficult decision to sell Outdoor Research and it is here that the next phase of OR's history begins. In one of the groups of interested buyers touring the facility, another dedicated outdoor athlete and businessman was looking for a challenge. Dan Nordstrom, a Seattle native, skier, bike racer, and alpinist had recently retired from his family’s business and in June of 2003 became the new owner of OR. Instead of being absorbed by a mega-brand, OR's tradition of passionate, outdoor enthusiast ownership carried forward. Under Dan's leadership, the team at OR has truly created and experienced a renaissance rooted in its past successes. The key, as it was under Ron, is a dedication to and a passion for creating truly functional solutions for human powered adventure. Since the summer of 2003,every aspect of OR has been scrutinized and improved - from product development to customer service to marketing, shipping, and beyond. All product categories have undergone a complete overhaul with the classic products seeing careful updates and improvements, and the next generation of classics breaking into the mix.These include products such as Alti Mitts™, Alibi Gloves™, DryComp Summit Sack™, NightHaven™, LightHaven™, M’s Chaos Jacket™, M’s Zealot Jacket™, W’s Enigma Jacket™, and W’s Solitude Pants™ to name but a few. Men’s and women’s apparel lines are united under the OR brand and have become a major emphasis for the company. In 2003, the company began reaching out to its customers in the form of the Lab Rat program. This popular program provides a line of communication between the user and OR’s product development team. Since its launch, thousands of people have had their say about the performance of the OR gear they own and have had a profound impact on the products in the line today. "All product categories have undergone a complete overhaul with the classic products seeing careful updates and improvements, and the next generation of classics breaking into the mix." Based on this feedback, individual products have been improved as well as entire families of gear created. The Lab Rat program represents one of the most basic truths about Outdoor Research: we believe that a true and clear purpose for each of our products can be immeasurably enhanced by listening to our customers and acting on their input. The renaissance continues and function remains at the core of the brand. OR products remain Designed By Adventure®.